How To Buy The Best Chainsaw - Which? How much do I need to spend to get a great chainsaw? What protective clothing do I need? This expert guide will help you pick out the best model for you. Want to choose the best chainsaw for you? Sign up today and join Which? to access all our expert reviews and Best Buys. This all depends on what type of chainsaw you want to buy, how much you can afford and how robust you need it to be. If you're using it only occasionally then a cheap, corded electric machine will be fine. But for more substantial jobs or more frequent use, you'll need to get a petrol chainsaw. Remember that you will need to buy appropriate protective clothing, too. A cheap corded electric chainsaw will cost less than £100 in DIY and chain stores. These usually seem to have all the features you might want at a low price. But they do tend to be less robust and may not be able to cope with tough jobs such as sawing through very thick, hard, wood logs. You also have to grapple with the cable, which restricts the number of places you can use it. If you're looking for a petrol machine from a well-known brand, you will usually pay a higher price, but you tend to get a more robust chainsaw that's easy to maintain. 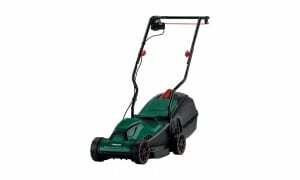 They can be considerably more of a pleasure to use than cheaper models, as they will be easier to start, have more power to cut quickly and cleanly, and will have more anti-vibration features to make them less tiring to use. 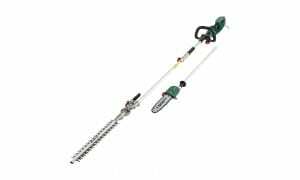 Petrol chainsaws are more expensive than electric ones, although you'll find some own-brand models in DIY stores for less than £100. 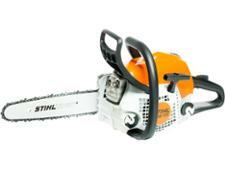 You’ll pay a more for well-known brands, such as Stihl, Husqvarna and McCulloch. All these brands have a range of models that vary in size and power depending on the level of work they're intended for, with prices to match. An entry-level machine from Stihl, such as the MS171, will cost around £150. Prices vary for corded electric models. 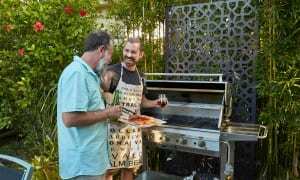 You can pay as little as £70 for an own-brand one from a DIY store, to more than £300 for a top-of-the-range branded model. For a cordless model you can pay as little as £95, rising to more than £400 for a top-of-the-range branded model. 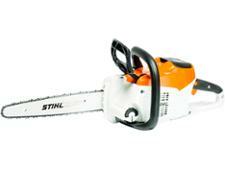 Cordless chainsaws have the convenience of electric and the portability of petrol. They are simple to operate, with rechargeable batteries and no messy fuel involved, and you can use them anywhere in the garden. However, currently their batteries don’t last for long, so you may find they need recharging before you’ve finished cutting. Although manufacturers are constantly updating the batteries to improve the power of these machines, currently they’re not powerful enough to match the cutting performance of petrol chainsaws. To choose the best chainsaw for you, it's worth taking time to think about what you'll be using it for, as well as how often you'll need to use it. Will you be cutting through a pile of logs every week, or will you be using it for occasional heavy pruning? Use our interactive tool to find one that has the right features for your garden jobs. What protective clothing do you need? These look like construction hard hats. They're designed to protect your head from the force of impact from the guide bar if kickback occurs, provided the chain brake has been activated and the chainsaw chain isn’t spinning. They won’t stop the path of the guide bar or the chain from cutting if it’s in motion. Most safety helmets have built-in ear defenders, and often transparent plastic or fine-mesh visors to protect the eyes from flying woodchips and dust. Prices start at about £15 online. Chainsaws are incredibly noisy and prolonged use can cause hearing damage. Whether you’re using a petrol, corded electric or a cordless battery model, always wear ear defenders. Most safety helmets will have ear defenders built in, but you can also buy them separately for about £10. These gloves are heavily padded with similar fabric to that used in chainsaw trousers. They are designed to protect hands, while still being flexible enough to let you work comfortably, and cost between £10 and £35 to buy. Buy a pair of safety boots that have a steel toe cap and a good grip to prevent accidental slipping when you’re using a chainsaw. Prices vary, starting at about £50. To get a good deal, it’s worth shopping around and comparing prices for protective clothing. Alternatively, you can buy the whole clothing kit (boots not included) for about £100. Find out more about cordless chainsaws.